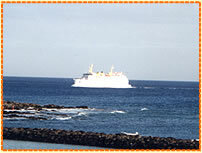 Places of interest in Lanzarote can be reached by car, taxi or tour bus. The road system leading to the main resort towns, have only, recently been laid, and are excellent. Timanfaya National Park  This area was devestated by volcanic eruptions over a period of 6 years from 1730  1736 Here visitors can appreciate the not only the awe inspiring scenery of "Devils land" caused by a geological phenomenon but land coming back to life with over 180 different plant species. The "Devil" restaurant where visitors can see food cooked over the heat from the volcano and witness geothermic experiments. A must do is the 45 min Coach Ride included in the entrance price, you will be taken around the volcanic route and listen to the story behind this unusual island. Mirador del Rio - Meaning River View this lookout point is located in the north of the island, on a cliff top position 479m above sea level. Created by Cesar Manrique the stunning views of neighbouring La Graciosa and the Canary Isle of Montana Clara are just wonderful. Cueva de los Verdes  Originally formed by the eruption of volcano Las Coronas, these caves are one of the longest volcanic galleries in the world, stretching 6km in length. During the 17th century, these caves acted as refuge to the local Canarian people from the pirates and slave hunters. Spectacular lighting add to the optical illusion and highlight the amazing natural structure. Jameos Del Agua  Designed by Cesar Manrique in 1968, possibly Cesars most prolific creation. An underground volcanic lava bubble caused by an eruption over 3000 years ago in the huge La Corona volcano, in the north of the island. Jameos meaning lava bubble, occurs when the ceiling of a lava tunnel collapses or during eruption when an exposion leaves a bubble underground. Visitors enter through a winding staircase, made out of the surrounding volcanic rock, entering into Jameos Grande a roofless volcanic bubble 100 mtrs long and 30 mtrs wide. This leads on to a beautiful garden and swimming pool. At the end is the concert cave, where a dance floor and bar with seating for 600 people have been created boasting the most wonderful natural acoustic amphitheatre. Cesar Manrique Foundation  Originally the studio and house of Cesar Manrique it was inaugurated in 1992 as a private non profit making self-funding foundation. Wholly engaged in the promotion of artistic, environmental and cultural activities in addition to the private works of Cesar Manrique. Highly Reccommended. Jardin del Cactus  Again created by Cesar Manrique, from a disused quarry, Cesar strived to show how beauty could be attained from the natural resources and the gardens show the indigenous flora of the island. Museum of Contemporary Art  This is located in the Castle of San Jose in Puerto Naos, Arricife. Originally a fortress built in 1776 by King Carlos 111. Museum of Emigrants  Standing on Guanapy Hill overlooking the old capital Teguise. The old castle of Santa Barbara started out as a watch tower, guarding the island on both coastlines. Originally built in the 16th century and converted into a fortress in1588. After a long period of deterioration, up until 1960 when groups of people have since restored it to its former glory. It is used as a museum for Canarian Emigrants, many of whom travelled to South America and include passports, family letters and postcards along with scale models and texts. El Golfo  On the west coast of Lanzarote, on the coastline of the Timanfaya National Park. The Green Lagoon was created by filling a volcanic crater with underground sea water. Algae has inhabited the water, causing the bright green colour, which against the black volcanic sands is an unique sight. Today the crater is only half of its original size and has been declared a protected area. Look carefully and you will find the naturally occurring semi precious stone called Olivina in the surrounding area. Papagayo Beaches  Situated to the east of Playa Blanca, beautiful natural sandy beaches set in wonderous coves. To retain the unspoilt nature of this area, travel to and from the beaches are on unmade roads by car only, but boat trips leave for the beaches from Playa Blanca Harbour. Aqua Park  Costa Teguise  fun for everyone, great slides, kiddies area. 18 hole Golf Course at Costa Teguise a true test, well laid out and different. Club hire and Carts available. Vineyard/Bodega - Teguise  Test the home made wines, with several to choose from. Camel Rides at Fire Mountain  With rides at Timanfaya, give it a try. Horse Riding  nr Yaiza on main road  Beach ride to Playa Quemeda also near Puerto del Carmen on circular. Boat Trips  available for fishing, underwater 'sight-seeing' and trips to the Papagayo Beaches or the neighbouring island of Fuertaventura. All leave from Playa Blanca Harbour. Tennis  Courts for hire at the neighbouring hotel. Golf  There is currently one course on the island, but another is under construction just up the road from Playa Flamingo.